1991 From 1991 in Kazakhstan for the first time officially celebrate Nauryz holiday. March 22 is the official day when Nauryz were celebrated. From 1991 in Kazakhstan for the first time officially celebrate Nauryz holiday. Nauryz holiday is one of the oldest festivals in the world. 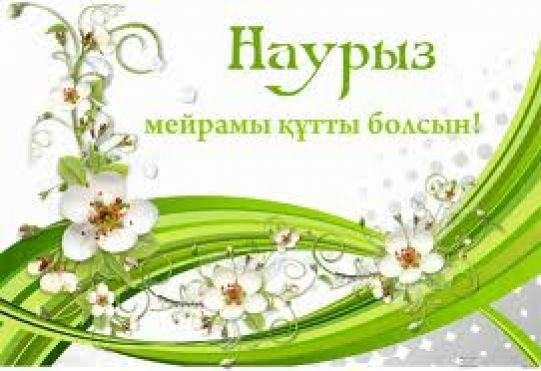 It is celebrated over five thousand years as a celebration of spring and the renewal of nature by many people of Near East, Central Asia and according to some data eastern Slavs. Historical data about this holiday are found in the writings of many ancient and medieval authors. According to Eastern chronology it corresponds to Iranian New Year (Navruz). Kazakhs, Uzbeks and Uyghurs from generation to generation transferred tradition of celebrating. Tajiks called it "Gulgardon" or "Gulnavruz", Tatars "Nardugan" and among ancient Greeks it was known as the "Patrih". The roots of holiday can be found in ancient pagan rituals. From ancient time the form of celebration itself carried the principles of love for nature. Despite the antiquity of this holiday it was preserved in the memory of the people and now has a new spiritual and ethical meaning. According to the ancient reckoning that day usually coincided with the March 22— the day of the vernal equinox. Therefore Kazakhs called the month of March Nauryz. It was believed that this day is updated in nature, the first spring thunders, swelling buds on the trees and lush greenery sprouts. It should be noted that Nauryz as secular holiday of spring and renewal has common roots and parallels with wires and many other significant moments in the lives of all people of Kazakhstan. If in this day were born boys, traditionally they were called Nauryzbay or Nauryzbek and girls just Nauryz or Nauryzgul. If in this day snowing, it was considered as a good sign. Even the girl's beauty in Kazakh legends compared with white snow of Nauryz as in March is usuallysnowing with a special white and soft fluffy snow. In the past, the Kazakhs called Nauryz the Day of Ulus of the people or the great day Ulus. The people become have tradition: the more generous will be celebrated Nauryz holiday, the more successful will be the year, hence, the abundance of holiday tradition and attributes. On the eve of the vernal equinox people tidy their house, pay off debts, put up if being in the quarrel, as elders said, when Nauryz comes into their house, all disease and failure must pass them by. The night before the celebration to mark the wishes of the abundance of milk, crops and rain all containers filled with milk, kefir (fermented milk product), corn, spring water and the day of Nauryz all tried to be in a good mood. People embrace each other with open arms, express best wishes to all the troubles and woes turned from them. Nauryz celebration began from traditional meeting dawn, which associated with the ancient ritual - "If you see spring - clean its source". All adults, youth and children , pick up a shovel, hoe , gather at the appointed place at the spring or ditch and made ​​his clearing when they facing the dawn. Then all together under the leadership of the venerable old men plant trees. At the same time, according to established tradition, uttered the words: "Let it remain in the memory of the human tree, rather than herd", "chop down one tree - plant a ten". After the performance of ritual activities three men in the form of zhyrshy (Kazakh folk singer) invited (crier) visited all the streets, squares and courtyards and called everyone to the holiday. They dressed in bright and festive costumes. They could be character of Kazakh fairytales like Aldar Kose, Zhirenshe and Karashash beauty. After they began a festive presentation. People have fun, congratulate each other with the New Year and wish each other good, sing songs, which for a long time been composed for this holiday - Nauryz zhyr, staged fighting of man and woman, competition in patter (zhanyltpash) and guess riddles (zhumbak). These day a lot of food prepared, which symbolized wealth and abundance in the coming year. At noon on the specified place at the village slaughtered bull and cooked from its meat the meat dish called "Bel-koterer", which means " straighteningthe figure" as the bull was considered one of the most powerful animals and the food from it give the strength and endurance to people. Dastarkhan (Tablecloth) covered in each family. Meal was timed to noon, before and after which mullah recited prayers in honor of ancestors. When the celebration complete one of the eldest of those give a blessing (bata), in order remain welfare of the family from year to year. In Kazakh tradition, during the celebration of Nauryz, number "7" was the compulsory, which represented the seven days of week - time units of universal eternity. Seven bowls with Nauryz -kozhe drink, which made from seven varieties of seven types of cereals, were served to aksakals (elders). These seven components typically include meat, salt, fat, onions, wheat, kurt(drained sour milk rolled into balls) and cottage cheese. Celebration is always accompanied by mass games, traditional jumps entertainment. The most famous and loved by people games are "Aikysh-uikysh" ("Towards each other") and "Audary-spec", during this game horsemen pull over each other from the saddle. Nauryz holiday is not complete without wrestling, where not only boys, but girls also could participate. Girls induce boys to the competition with the condition that if he wins, he can get right to marry her, but if she wins he must obey and carry out any of her desires, in such cases Nauryz turned into wedding celebrations. All people regardless of gender, age and social class, released from daily duties and on equal rights have been actively involved into fun and games. At this time, all sorts of ethical prohibitions were removed in the relations between men and women, even those that have always existed between senior brother-in-law and sister-in-law. Scientists believe that this game for fun is the echo of free joint meetings and mass entertainment in the days of the revival of the dead nature between two clans and fraternities, when for the short time removed restrictions and prohibitions in the relationship between men and women. The day finishes with representation where two bard in verse form compete in songs. They stop the contest when the sun goes over the horizon, when good triumphs over evil. Then they light up a bonfire and people with lighted torches visited all the neighborhoods of the village, singing and dancing, thereby completing the holiday of spring renewal and equinoxes. The history of Nauryz has difficult fate. In the era of the formation of totalitarian system, when all national was found as insignificant. All references to the traditional heritage listed as anachronisms and remnants of antiquity. Nauryz was abolished in 1926. It was celebrated in 1988 for the first time after a long time being forgotten, and ironically it received wide publicity. Official recognition of Nowruz Celebration acquired March 15, 1991 after the Decree of the President of the Kazakh SSR "On the national holiday of spring - "Nauryz". President announced March 22, the vernal equinox, a holiday - "Nauryz". Since that time began wide celebration " Nauryz " throughout the country. Certainly, modern shape of holiday differ significantly from their previous contents. It is not only theatrical performances and a richly decorated yurt, deliciously cooked Nauryz-kozhe, but also holding fundraisers, folk sports games, greenery maintenance , planting trees , cleaning parks and other recreation areas, streets and squares. Nowadays " Nauryz " became a national holiday of spring and labor unity. Today this holiday is equally significant to all peoples living in multinational Kazakhstan. Ancient holiday Nauryz harmoniously transformed into modern life while preserving the continuity of traditions of antiquity.